Pelican's XXL Wide-screen Laptop Briefcase! The Pelican 1495CC1 Laptop/Notebook Computer Case fits up to 17" laptops. 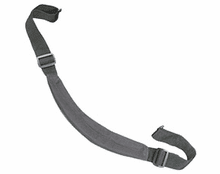 Combination lock and detachable/removable shoulder strap are included. 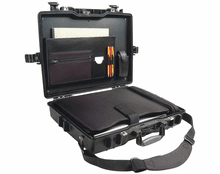 This case is Black with Lid Organizer/Briefcase feature and custom fitted shock absorbing tray. 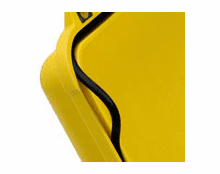 In addition to the shock absorbing tray, a removable soft padded protector sleeve (pictured below) is included so that your laptop or notebook computer fit inside for even more protection. 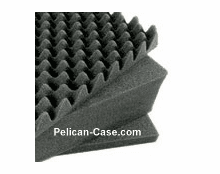 Also included is a storage pouch that fits inside the Pelican 1495CC#1 case and next to the padded protector sleeve. The storage pouch is for laptop/notebook power supply/adapter and other laptop cables like USB, Firewire, or stereo headphones.